Titan Fitness bumper plates are excellent additions to any home gym. 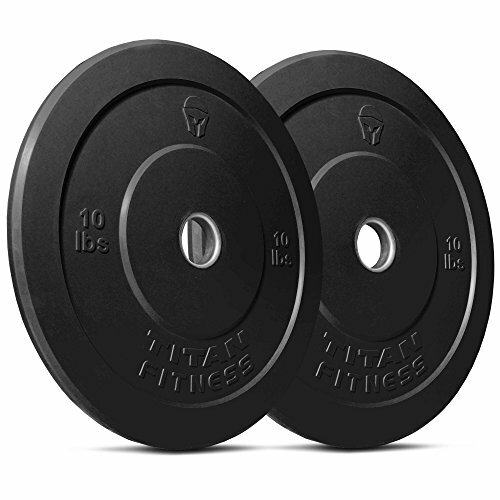 This is a pair of 10 lb black rubber bumper plates. The 2" steel-lined center holes snugly fit Olympic size barbells and maintain their shape in between uses. This is an economy bumper plate, perfect for use in a home gym, and is not intended to withstand being dropped or thrown on the floor. Please note that rubber bumper plates may have a sheen present on the finish from manufacturing, which can easily be removed with a mild dish soap. We also offer 60" and 86" Olympic bars, plate and barbell storage trees, and power racks to push them up from. Dimensions: Inner ring diameter - 2"; Total diameter - 17 3/4"; Height - 1"
Also available: Check our other listings for plates of different sizes and colors, Olympic bars, and storage trees.